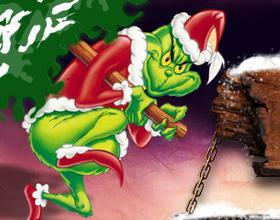 Steal Christmas with the Grinch this Month! Uh oh! The Grinch is at it again! He is the cold, green, furry, yellow-eyed creature with an evil grin and a tiny heart that lived up, up above the little village of Whoville. Remember how he tried to steal Christmas by stealing all the decorations, all the Christmas trees, all the food, and all the presents from all the little Whos? In the end he supposedly learned his lesson, but apparently he did not learn his lesson well enough and is back at it again. This time, on the other hand, he is doing things a little differently. Instead of stealing all the things he stole the last time he is going after something else. The Grinch is going after the casino cash at Palace of Chance, and you can get in on the action. Kick off the trickery with our first Christmas bonus. It is a 560% bonus good for playing slots and keno at Palace of Chance. This bonus comes with a 30x playthrough requirement and a 10x max cash out limit. You can acquire this bonus by visiting the monthly promotion page at Palace of Chance for the coupon code and then going to your account and depositing at least $70 and entering the coupon code. This is one of the best gifts the Grinch will be stealing, but you can steal it before he does. Jump on this fast. You can redeem it as many times as you want, but once the Grinch has taken it, it’s over. Another one of the fantastic presents the Grinch plans to steal is this next bonus. This one is a 350% bonus that is also good for playing slots and keno. This one, though, has no rules! It has no playthrough requirement and no max cash out! You can get this bonus code also on the monthly promotion page at Palace of Chance. Then you can redeem it by entering the coupon code along with a deposit of $50 or more. Grab it before the Grinch does! You can redeem this one unlimited times, also. The third bonus you can bag is another great one. This one is a 160% bonus good for all the allowed games with the exception of Blackjack. This bonus does not have any rules either! There is no playthough requirement and no max cash out either. How awesome is that? You can get this bonus code at the Palace of Chance monthly promotion page. Once you have it, you can redeem it by entering the coupon code when you deposit at least $30. Beat the Grinch on this one! You can redeem this one unlimited times, too. The Grinch does not discriminate when it comes to his antics. VIPs are included in the debacle, too. VIPs, get in and grab these special bonuses before they are gone! The first special VIP bonus is a huge 630% bonus! This one good for playing slots and keno at Palace of Chance, and it comes with a 30x playthrough requirement and a 10x max cash out limit. Grab this bonus with a deposit of $70 or more and by entering the coupon code found in the VIP section of the monthly promotion page. You can redeem this bonus as many times as you want! The next VIP bonus is a 370% bonus that is also good for playing slots and keno. This one has no rules! It has no playthrough requirement and no max cash out! You can get this bonus code on the monthly promotion page at Palace of Chance, and then you can redeem it by entering the coupon code along with a deposit of $50 or more. Grab it before the Grinch does, VIPs! You can redeem this one unlimited times, as well. Finally, there is a 230% bonus good for playing all allowed games at Palace of Chance. This one doesn’t have any rules either, no playthrough requirement and no max cash out! Get the coupon code from the monthly promotion page at Palace of Chance and enter it along with you deposit of at least $30, and, yes, this one is also redeemable unlimited times. The Grinch is on your side! But don’t forget that the Grinch is a mean one. He is going to steal everything, so grab these bonuses before he does! Merry Christmas from all of us here at Palace of Chance!